A grant from the Hansen Foundation in support of the arts helped fund activities and enrichment opportunities for a multi-county area in NW Kansas. 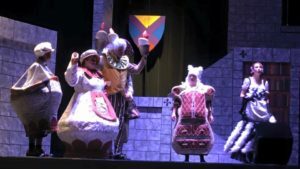 Citizens were actively involved in the arts programs by attending professional shows and by participating as actors and musicians in community theater productions. The summer production was so ld out every night, drawing people from several counties as participants as well as attendees. This year the show included more than 50 cast and crew members. Many area adults and youth participated in instructional arts classes and creative kids day camps, which provided not only a teaching atmosphere, but made available a place for artists of all ages to meet, learn, share, and display their talents.